Cryolipolysis cool shape machine is a new, non-invasive way to gently and effectively reduce fat in targeted areas of the body that results in a noticeable, natural-looking fat reduction in the treated areas. Triglyceride in fats will be converted into solid in particular low temperatures. What makes the Cryolipolysis procedure feature is that it uses advanced cooling technology to selectively target fat bulges and eliminate fat cells through a gradual process that does not harm the surrounding tissues. This procedure can reduce unwanted abdominal fat, love handles (flanks) and back fat. When fat cells are exposed to precise cooling, they trigger a process of natural removal that gradually reduces the thickness of the fat layer. And the fat cells in the treated area are gently eliminated through the body’s normal metabolism process, to eliminate unwanted fat Through the freezing effect, remove the fat cell triglyceride off heat, and will remain at 4 ℃, so the cold coagulation, and therefore premature aging and death. Fat cells in the cold, it will start clearing the natural decomposition process, so that gradually thinner fat layer. Through the normal metabolic processes, decreasing the fat layer, to achieve the purpose of partial melting fat. Fat cells can be significantly reduced, the fat layer also will become thinner, so that the fat blocks will be killed one by one. Cooling skin protection while lifting and tightening. The contact cooling of the hand piece surface regulates the temperature of the skin and protects fine dermal structures, realizing the fast body-reshape effects while tightening skin! During the procedure, exposure to cooling causes fat cell apoptosis, which leads to the release offat layer. The fat cells in the treated area are gently eliminated through the body's normalmetabolism process, much like fat from food. 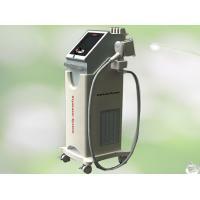 The Cool Sculpting procedure is non-invasive. Most patients typically resume their routineactivities, including returning to work and exercise regimens on the same day as theprocedure.Transient local redness, bruising and numbness of the skin are common side effects ofthe treatment and expected to subside in couple of hours. Typically sensory deficits will subsidewithin 1~8 weeks. Will treating the distance be painful? With this non-invasive procedure, there is no need for anesthesia or pain medications, and norecovery time. The procedure is comfortable for most patients can read, work on their laptop computer, listen to music or just relax. Patients experiencing fat layer reduction show persistent results at least 1 year after the procedure.The fat cells in the treated area are gently eliminated through the body's normal metabolismprocess. The elimination of fat cells as a result of the procedure is expected to last as long as fatcells removed by invasive procedures such as liposuction. How do the results compare with other procedures such as liposuction? liposuctionbenefit:The results of the liposuction procedure are very rapid and dramatic .Side effect: pain, fatal risk, recovery time even body asymmetry will occure during surgicalprocedures.